Our Miele Centre kitchen showroom at our Gerald Giles store in central Norwich played host to our recent cookery event. We take these opportunities to showcase our extensive range of Miele kitchen appliances, the Miele PureLine pyrolytic oven, warming drawer for that all essential dough prove, the induction hob for the careful control of heat when making the orange curd, we don’t want the Miele DA7006 Island Extractor to be too efficient and whisk away all the delicious smells! We make full use of the Miele Centre appliances by holding cookery events throughout the year with local cooks and chefs. 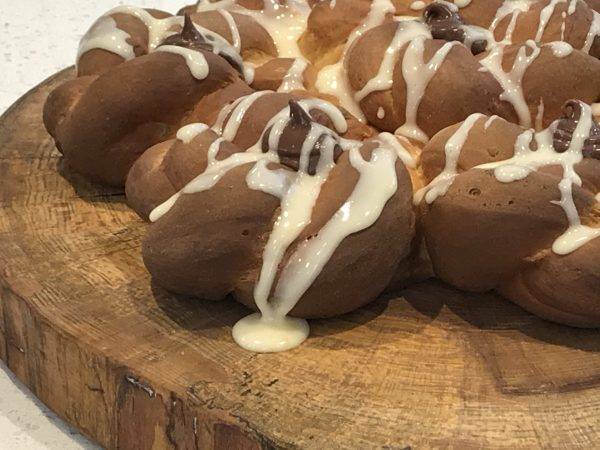 One of our latest cookery events was hosted by Kate Barmby, demonstrating two delicious recipes for family Easter celebrations. Kate was a contestant on the Great British Bake Off in 2016, a mother and a nurse who lives in Norfolk and is an advocate of quality fresh local produce. Kate’s passion and love of baking shines through in her cookery demonstrations, she warmly shares great tips and tricks to help you achieve a delicious bake. We also get an interesting insight into her experience of being a contestant on the Great British Bake Off. 1. Put the strong white bread flour in the bowl of a stand mixer that has been fitted with a dough hook. Alternatively, you can mix by hand in a large bowl but this is a sticky enriched dough that can be a little bit tricky to handle so on this occasion I would recommend using a machine if you have one. 2. Add salt, fast action yeast, caster sugar and the finely grated zest of 2 oranges. Mix on a slow speed. 3. Gently warm the milk and water with the butter and the crushed cardamom seeds. Once the butter has melted strain the seeds from the liquid. 4. Gradually add the warm milk mix (make sure it’s warm and not hot or it will kill the yeast) along with the eggs that have been lightly beaten. Mix for about 5 minutes until the dough is soft and smooth. 5. Tip into a lightly oiled bowl and cover with cling film. 6. Prove until the dough has doubled in size and springs back when you press it, approximately 1 hour. 7. Tip the dough onto a floured surface and knock it back. Shape it into a smooth ball and then roll it into a 30cm circle. 8. Place a small upturned bowl or drinking glass (about 9cm in diameter) in the centre of the circle and using a very sharp knife cut the dough into quarters from the edge of the dough to the rim of the bowl or glass. 9. Cut each quarter into 4 evenly sized wedges then remove the bowl or glass. You should now have 16 wedge-shaped strips surrounding the uncut centre. 10. Take two strips that are side by side and twist them together about 5 times; pinch the ends together then coil the twisted dough into a round. Arrange this round on the uncut dough in the centre of the circle. 11. Continue to twist and pinch the remaining 14 strips together in pairs, coiling and arranging them into 7 petals that surround the central rosette. 12. Make 8 balls of foil about 2.5cm in diameter; wrap these balls in a small square of baking paper. Carefully place 1 in the centre of each petal to ensure that once the bread has baked you have a hollow for the filling. 13. Transfer the loaf onto a baking sheet that has been greased or lined with baking paper, reshaping a little if necessary. 14. Cover the loaf with a clean tea towel or a large polythene bag and leave to prove for approximately 45 minutes until it has doubled in size and springs back when you press it. 15. Pre-heat the oven to 180°C (fan). 16. Remove the tea towel or bag but leave the foil balls covered in baking paper in situ. Bake for 30 – 35 minutes until the bread is golden brown and sounds hollow when you tap it. Transfer onto a wire rack and leave to cool slightly. 17. Fill a disposable piping bag with chocolate spread and snip off the end to give you a fairly wide opening. Remove the foil balls and pipe chocolate spread into each of the 8 hollows. 18. Mix enough of the icing sugar with the juice of 1 orange to make a glaze and fill a disposable piping bag. Snip off just the very tip of the bag and pipe the glaze backwards and forwards across the petals and over the chocolate spread. Allow the glaze to set before serving. • The chocolate spread can be replaced by raspberry jam or lemon curd if you prefer. • You can use teaspoons instead of piping bags to fill and glaze the bread if you don’t mind a slightly more informal finish. 1. Preheat the oven to 180°C (160°C fan, gas mark 4). 2. Grease and base line 3 25cm diameter loose bottomed cake tins. 3. Put all the ingredients except the orange zest, juice and blueberries in a bowl and beat with an electric mixer for a couple of minutes (a little longer if you are doing this by hand). 4. Stir in the orange zest and juice. 5. Cut your blueberries in half and toss them in a heaped tablespoon of flour. I appreciate that this is a little fiddly and time consuming but it is definitely worth it to help stop your blueberries from sinking. It is a quite good job to delegate to any available smaller members of the family with nimble fingers! 6. Divide approximately half the cake batter between the 3 tins and spread it so it is level. 7. Fold the floured blueberries to the remaining batter and then divide this equally between the 3 tins and level, again this is to try and help prevent sinkages. 8. Bake in the preheated oven for approximately 25 minutes until the cakes spring back when you press them. 9. Allow the cakes to cool for a few minutes before running a knife around the edge of the tin to loosen them and transferring onto a rack and leaving to cool completely. 10. Fold 4 tablespoons of the orange curd into the whipped cream and use this to sandwich the 3 cakes together. 11. If you have time freeze the cake at this stage before applying the ganache as this will make the cake much easier to coat. 12. With a palette knife apply a smooth coating of ganache to the sides and top of the cake. 13. Make sure you are not wearing your best white shirt and cover your baking area with baking paper or something similar, it might even be a good idea to do this outside if it’s a nice day – this is a messy business! 14. 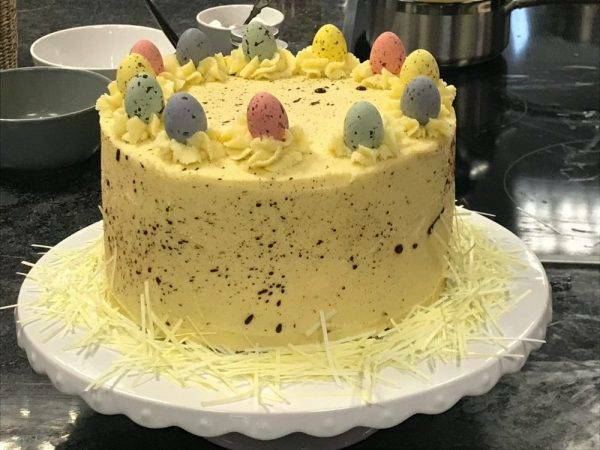 Use a clean new stiff paintbrush or toothbrush to flick splatters of the cocoa that has been mixed with vanilla extract all over the surface of the cake so it resembles a speckled eggshell. 15. Use the remaining ganache to fill a piping bag fitted with a 2d piping nozzle (closed star). 16. Pipe 12 swirls around the edge of the cake and sit a speckled egg in the centre of each one. 1. Put the lightly whisked eggs in a medium saucepan, then add the rest of the ingredients and place the saucepan over a medium heat. 2. Whisk continuously for about 8 minutes until the mixture thickens. 3. Reduce the heat to the lowest setting and gently simmer the curd for a further minute, continuing to whisk. 1. Put all the ingredients in a medium-sized saucepan and heat gently, stirring continuously until they have just melted. 2. Pour the ganache into a bowl and leave the ganache to cool. 3. Once cool whip the ganache until it is light and fluffy. I think the brightly coloured flecks of orange zest look particularly attractive when the cake is cut and I also love the pairing of blueberries as a softer alternative to lemon but you can, of course, go for the classic combination of blueberry and lemon if you prefer. If they are in season blood oranges make a delicious curd. I would still add the juice of a lemon to add just a little bit of tartness. Any leftover curd can be stored covered in the fridge for up to a week (or longer if put into sterilised jars) and is wonderful spread on soft buttered white bread or maybe even a hot cross bun. This cake also looks beautiful in blue; just add a dab of paste colouring to the ganache.